Words are very important, there could be disastrous meanings with a use of a synonym that eventually blows the whole context out of proportion. Words are especially to be seen in a formal conversation like an interview. 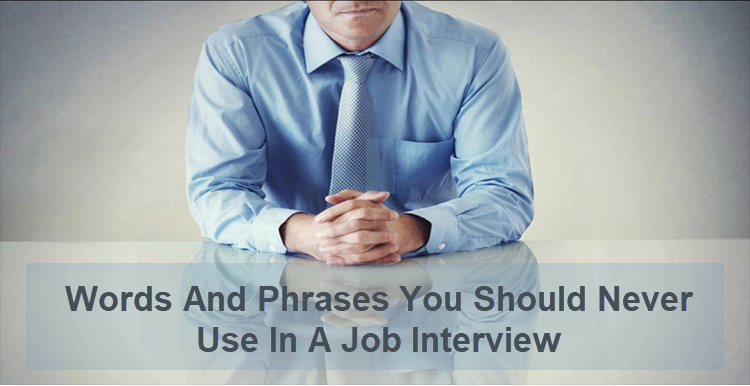 Job interviews are brittle, they could crack up in a jiffy and you could lose it all. On the other hand, they could be strategically strengthened. Using the right words and not using the right words is very important to win the interview. Although there is a thin line which people sometimes do not realize and cross to the no man’s land. In this article, you would come to know about the right words to be used in an interview and the wrong ones which you are not supposed to use. We have divided this into two parts- in the first part, we would cover the words that should not be used or said in an interview and the second part would tell you about the words which could do the magic. The one-word answer especially a negative one like ‘no’ is one of the most dangerous ones. That doesn’t mean you can’t answer a question with a no. There could hundreds of questions that deserve the ‘no’, but the key to an acceptable ‘no’ is justifying it. Yes, silence followed by a no is like you are giving an order, but giving an explanation to your no gets it all straight. Well, showing proactiveness is a good thing, but again you need to mark the threshold. Drawing the line is all the game. You might be wanting that job more than anyone in the world, you have your reasons but if you jump on to everything being asked to you to do, you would surely become a desperado. An interview is a psychological game, it is like poker, you can be out of the game even before the show of the cards. Wear the poker face. As said above one-word answers could spoil everything till eternity, and so you should again reinforce your one-word answers with a whole a statement or probably by asking the interviewer back. For eg. don’t answer just ‘fine’ if the interviewer asks you ‘how are you?’ Instead, you could say- ‘I am doing just good/fine, how about you’. That would break the ice too. There is a subtle difference in the usage of ‘I’ and ‘we’. Both these words are important but important in different context. If they are exchanged in context, you might lose just cause of a letter or better- two. ‘We’ should always be used when you are talking about a team, probably our old team or anything that denotes a team effort. ‘I’ on the other hand should be used when the interviewer stresses on ‘you’ (your). For eg. asking about your achievements. The power of the two letters in ‘we’ is greater than, the one letter in the I, not only by the strength of the letters in these words but the sheer meaning and context. ‘We’ shows you are a team player and you see the common objective and goals of a team or a group above everything else, and that is what interviewers seek. ‘We’ also reflects that you can lead people, although the usage of the word is subjected to the situation. At times ‘I’ is more relevant, completely depends on the situation or the question asked. The words leader does the magic. It gives an interviewer a sneak peek at what you seek in future. It is subtle and should be used subtly. You should use this word such that it does not look as if it is un-required. Putting the word in the right way drops a hint to the interviewer. “would love to see myself leading a team in a few years” or “leadership is the essence of management”, depends completely on the question asked or the context being talked. A word that should not be missed in an interview is—initiative. The word ‘initiative’ tell that you are a self-starter and every interviewer or a hiring manager is seeking someone who doesn’t need a push. It is much easier to squeeze in, as an interview is incomplete without sharing your initiatives unless you have taken one. At the end it is all about numbers; be it how much the sales grew or how much money was saved. Irrespective of the function you are in, you can always incorporate the word ‘measurable’ or ‘measurable results’ in your interview. An interviewer seeks to understand your quantifiable skills, and not only using the word is important you need to prove it through numbers. The word ‘measurable’ reflects your keenness for quantifiable results. The word ‘thank you’ has a sole purpose and that is, to show the gratitude and is a major part of etiquettes. An interview is an opportunity and showing gratefulness for a chance given to you is the right etiquette. Remember, the right words make the right impact.